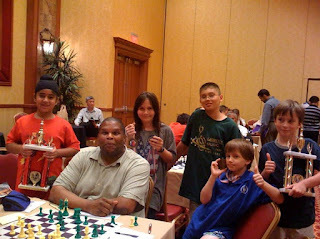 "Coach Rene Phillips with the Chess Gym New Orleans Team in Las Vegas. Simar Chada tied for 5th in the Boys Under 11 section, & the Chess Gym team placed 4th in that section of 13 teams. In side events, Simar placed 5th in boys umder 11 Blitz; Cecilia Tisserand placed 5th in Girls Under 14 Blitz & 6th in Puzzle Solving for ratings under 1000; Miles Tisserand is World Champ in Puzzles for those under 600; and Eli Karp is 5th in Puzzles for those under 1000. About 275 Boys & Girls competed in the event, and this was a fabulous showing by the Louisiana team. The kids & their parents can't thank Rene enough for his coaching and hard work!"